Shaun Kippin waits for the puck drop. Photo by IceHockeyMedia. 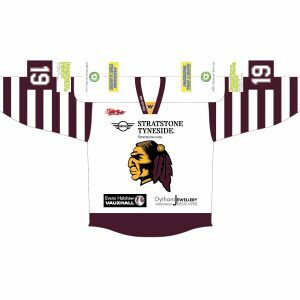 Whitley Warriors endured a heavy 11-3 defeat to Hull Pirates at Hillheads on Sunday evening. 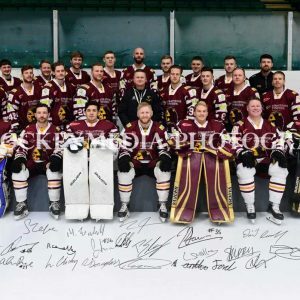 Though missing injured netminder Richie Lawson and suspended forwards Dean Holland and Ryan Sample, the Warriors filed onto the ice with a strong line-up at their disposal ahead of their encounter with Jason Hewitt’s twenty-man team. Callum Watson opens the scoring. Photo by IceHockeyMedia. Whitley got off to a flying start as Canadian Phil Edgar played a pass from behind Ashley Smith’s net to find fellow forward Callum Watson who bundled the puck home twenty nine seconds in. 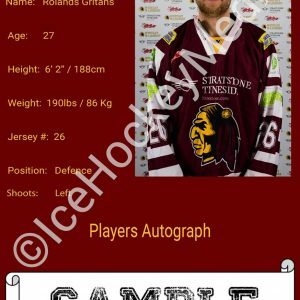 However, when Latvian defenceman Rolands Gritāns accidentally struck Hull’s Alternate Captain Samuel Towner in the face following an attempted shot on goal, the resulting pause in play killed Whitley’s momentum, allowing the Pirates to equalise through right winger James Archer who fired into the roof of Jordan Boyle’s net with support from Czech forward Lubomir Korhon on 2:02. A tripping penalty for Whitley’s ‘D’ man Josh Maddock then allowed the visitors to work in their offensive zone and, although unable to capitalise on the power play, Hull accomplished an even-handed goal moments later as Swedish winger Sonny Karlsson was allowed time and space to hit the target on 10:23. 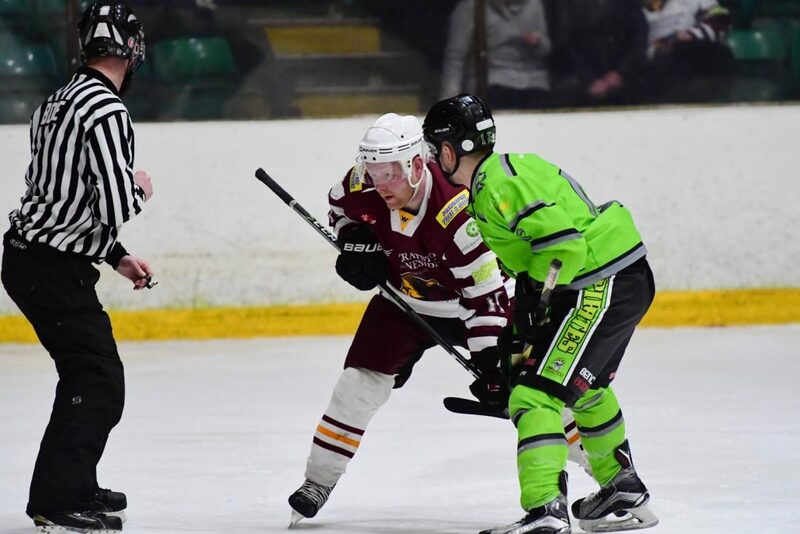 Fifty five seconds later, Martin Crammond’s slashing offence left the Warriors shorthanded once again and this time Hull were quick to capitalise as Chamberlain set up Towner. Though Whitley introduced backup netminder Rory Dunn to the game to allow Boyle some reprieve, the Pirates remained fully in control as Karlsson achieved his second of the evening to make it 4-1 just over two minutes later. 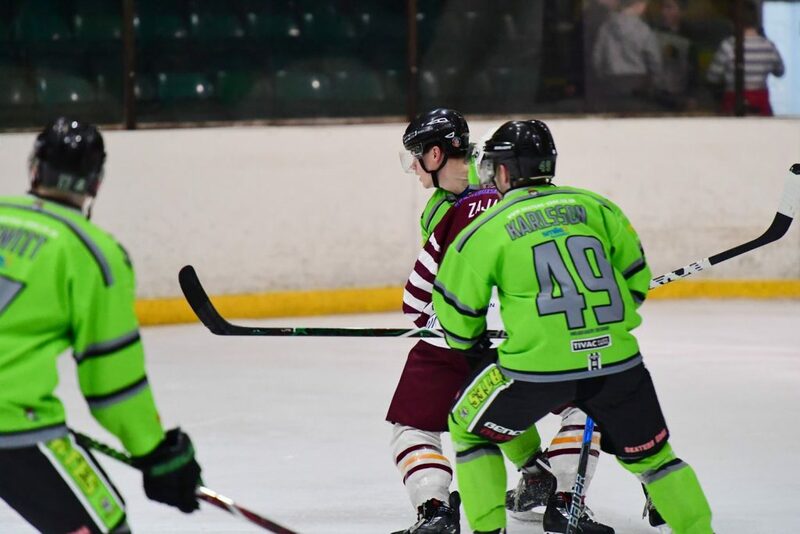 Struggling, the Warriors were further hindered when Gritāns was sinbinned for holding, presenting Hull’s Captain Jamie Chilcott with the chance to secure his team’s fifth goal before the first interval. Sonny Karlsson. Photo by IceHockeyMedia. 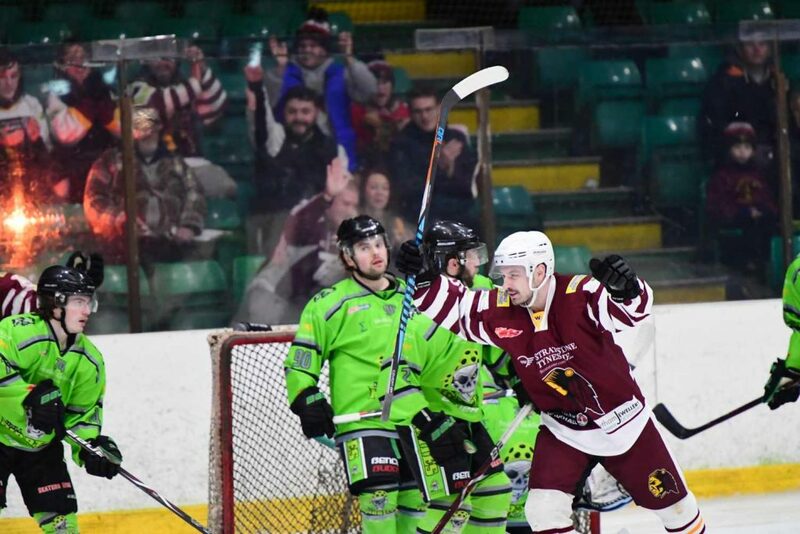 The Warriors’ woes were enhanced early in the second period when the side killed Ben Campbell’s hooking penalty only for Hull to make it 6-1 three seconds after Whitley’s return to full strength, Towner beating Boyle who was restored to his net at the start of the stanza. Two minutes later, Hewitt teamed up with Karlsson to assist Chamberlain, leaving the home team six goals adrift of their opposition. Striving to increase their offensive work, Whitley gradually applied pressure to the Pirates’ defence but created little to trouble Smith; Campbell and Edgar with the best of their team’s chances. An interference penalty for Hull’s defenceman Lee Haywood then provided the Warriors with some hope but the side’s fruitless power play was only followed by an eighth goal for Hewitt’s men as Chamberlain rounded Whitley’s net to find Karlsson who fired over Boyle’s glove on 33:28 to claim his hat trick. A second unsuccessful power play for the Warriors preceded a defensive error as Boyle was left unprotected to allow Chamberlain to make it 9-1 going into the final period. Niall Ryder prepares to unleash his goal-scoring shot. Photo by IceHockeyMedia. Having struggled on previous power plays in the contest, it was unsurprising that the Warriors could not double their tally when Karlsson was sidelined for hooking on 41:21. 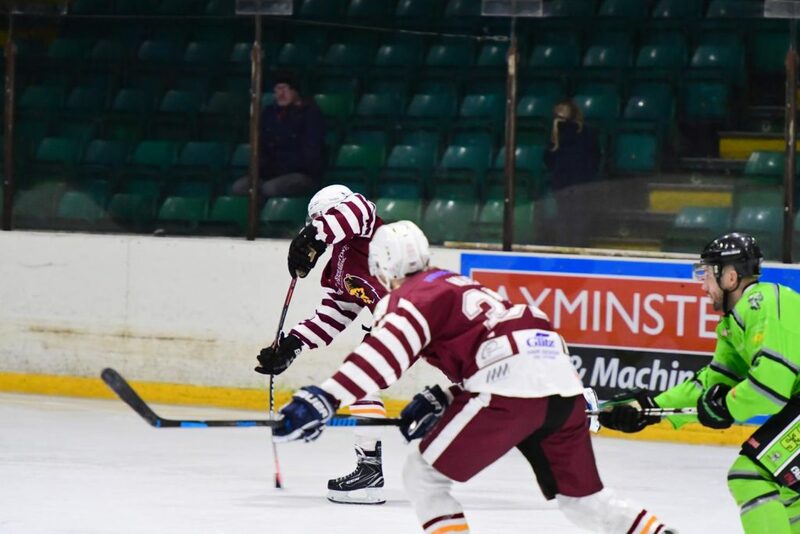 Soon after, Hewitt took his team into double figures as he made the most of neat play from Chamberlain and defenceman Chris Wilcox to further widen the gap between the outfits. Whilst Hull allowed backup netminder Joseph Gent to feature, Player-Coach David Longstaff gave ice time to former recreational players Gary Walker and Adam Perrie, youngster Jamie Ord and forward Niall Ryder, and it was a decision which paid off for the Warriors when stand-in Captain Shaun Kippin combined with Walker to find Ryder on the wing. Unleashing a sweet shot which breezed past Gent, Ryder renewed his side’s belief and a series of long range shots ensued from the home team who decided this was the best way to beat the netminder. In consequence, a fabulous unassisted shot from Alternate Captain Sam Zajac struck from the right of the centre circle defeated Gent just over two minutes later, making it 10-3. Buoyed by their improved performance, the Warriors were hopeful that they could narrow the gap further but this task proved to be too much and instead, it was Hull who had the final say as Chamberlain slipped the puck beneath Boyle on 57:29 to simultaneously complete his hat trick and his team’s scoring.